We get lots of great questions here at Springs, from both prospective residents and from those of you who are already part of our community, so we thought we’d answer some of them in our blog. If your questions aren’t listed here, we encourage you to get a hold of us directly – we’ll be happy to answer them! Also, keep an eye on this blog – if you’re asking it is likely others are too, and we’ll probably cover it in a future article. 1: Why did my rent change? 2: Will my rent go up next year? We certainly hope not! We do everything we can to keep rents as low as possible, but sometimes increases are necessary to continue to offer the level of service which we promise to provide and which you expect and deserve. 3: Do you hear your neighbors? Our buildings are designed to minimize noise floor-to-floor and between apartments. Occasionally a resident will comment on loud noise coming from a nearby apartment – usually music. We encourage residents to politely talk with their neighbor, who may not be aware that their music can be heard and who’s happy to comply with others’ wishes. Most times this takes care of it, but if you are uncomfortable approaching them, the leasing office will be happy to assist. It doesn’t hurt to let us know even if you do speak with your neighbor, just so we have the story should your conversation not solve the problem. 4: Is the community located in a safe area? Our development team does a great deal of research on the cities where we build our communities, looking for the optimum balance of convenience, attractiveness and a suburban lifestyle. Unfortunately, personal safety cannot be guaranteed, no matter where we reside. We provide great safety tips in our lease package, many of our own team members live on site and most Springs locations are home to an on-call courtesy officer who works for a local police department. 5. Do you perform pest control? Yes we do! We know that climate makes pests a potential annoyance, and we treat our properties regularly to prevent any issues. And, if a resident sees that they have an ant problem or notice some kind of untame animal on the property, we encourage them to let us know so we can take action right away. 6. Do you have storage in the apartments? Every apartment has the amount of storage appropriate for its total square footage (small apartments have somewhat less than larger apartments). Typically, the storage is located in the kitchen, hallway, bathrooms and bedrooms. We think you’ll find that our walk-in closets are quite spacious. However, apartments don’t include storage for large items not currently in use, like mattresses, bureaus or moving boxes. 7. Why should I sign a lease here? If you’re looking for quality apartments, a welcoming, friendly community, a service approach that puts residents first, and a pleasing, atmosphere, this is it! 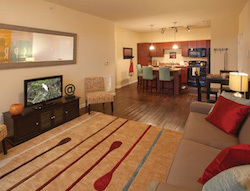 The Springs lifestyle provides a place you will enjoy living in and a place you will want to come home to. This is a community– it’s your home, and we and our residents treat it that way. 8. Can I paint the walls? We know people have decorating preferences and colors that make them feel more at home. What we ask, if you decide you’d like something other than the neutral color we’ve selected, is that you let us know first and take a great deal of care to tape around wood trim (please don’t paint the baseboards), protect the floors from drips, and opt for colors that are not dark (like navy blue, purple, and red) which are difficult to paint over should you move out. When you leave, the walls must be returned to condition they were when you moved in. We also offer painting services at a small charge to residents – most of whom are happy not to tackle the job themselves! 9. Are utilities included and how much will they cost? We do not include the cost of any utilities in the monthly rent and your cost is based solely on your usage. Water and sewer are billed with your rent, but each apartment is individually metered, so we act sort of like the middle man. Trash is a flat rate which billed monthly with your water and sewer. You pay your electric/gas bill directly to the local utility company, and again, each apartment is individually metered. You must have the account set up in your name before you move in. We will handle water, sewer and trash setup for you. 10. What type of dogs to you allow? We have just a few restrictions on what kind of dogs we accept, including Bull Terriers, Pit Bulls, Rottweilers and Dobermans. Some other breeds will require proof of passing an obedience course and an in-person pet interview. We have no weight limit, so please bring your Teacup Yorkie and your St. Bernard. We’ll be excited to meet them! Want to know more? Submit your questions below or simply complete our online contact form. It’s our job to answer your questions quickly and thoroughly, so don’t hesitate to reach out!